Multipurpose packaging ideal for sending books, catalogues, CD‘s, DVD’s and other media safely and securely through the post. Manufactured from recycled corrugated board these wrappers are available in several standard sizes and styles to accommodate a variety of products. 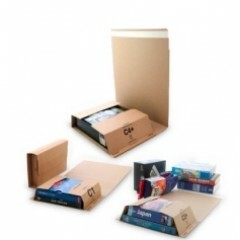 These wraps can accommodate sizes up to the maximum specified with a unique design that securely hold the contents in place. Quick and easy to assemble with self-seal tape, these finished packs offer superior protection to conventional padded bags and plain boards with a built in crumple zone. The larger postal boxes are excellent for larger items & consignments but are still fast to assemble with a quick erect base & unique variable depth.